When you think of Skiing, your mind automatically goes to the various famous ski resorts in places like Europe, Canada, North America, etc. But have you ever thought about Argentina as a destination for skiing? If not, you probably should. The Andes, the longest and one of the tallest mountain chains in the world runs through Argentina. The snow-capped mountains slopes are just perfect for skiing and so numerous ski resorts have been opened up all over the country. 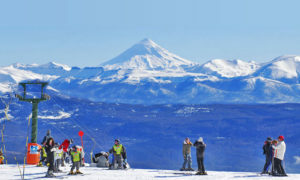 From the beautiful white slopes of Las Leñas or the tree covered wildness of the Lenga forest in Chapelco, Argentina has something to offer for every kind of people seeking the thrill of skiing. Penitentes ski resort and cabins. Opened in 1979, this resort is built over 300 hectares of skiable slopes. There are 20 different courses or trails to choose from, with each of the trails having its own quirks and difficulties. Some of the trails are quite simple enough for even a beginner to enjoy while others are difficult enough to play host to too many national and international skiing competitions. 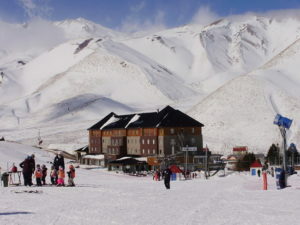 The resort is one of the most beautiful in all of Argentina with a magnificent snow garden that lets visitors enjoy a spectacular view of the snow-covered mountains. There are some different types of hotels available for staying at the foot of the mountain from budget stays to classy 4-star hotels. Mount Chapelco full covered in snow. 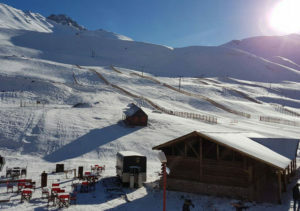 Mount Chapelco is a great destination for skiing enthusiasts that offers some of the best skiing trails and views of the surroundings in Argentina. The slopes of the mountain have attained international fame in recent years with scores of tourists flocking to Argentina to visit this enchanting place. The mountain is more nearly 2000 meters tall, and one can get to some breathtaking views of the Lake Lacar at the foothills. The surrounding Lenga forest gives the scenery a dash of green making the resort a place right out of one’s fantasy dreamland. The park has a great infrastructure with more than 20 trails and even a Snowpark where snowboarders can show off their skills on the various slopes and rails. Caviahue at night with moonlight reflection in the lake. The Caviahue ski resort covers a massive area of nearly 1000 skiable hectares. The resort lies right at the foothill of the mighty Copahue Volcano. 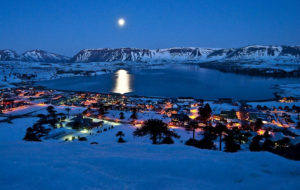 And thus, this resort can offer something apart from just skiing – a relaxing bath in the various volcanic hot springs. These hot springs are said to be full of minerals and thus help in revitalizing your body for more skiing action. The resort is filled with considerable tree cover, and some of the 20 plus trails go right through them. This is the ideal resort to visit with your family because it has something on offer for everyone. Las Leñas hotel to stay in during travel. 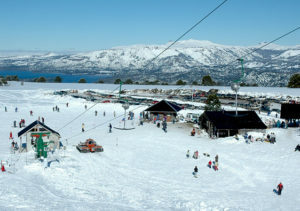 One of the most modernized ski resorts in the world and also one of the highest in all of Argentina. Las Leñas is a winter paradise built with the help of the latest technology known to mankind. The resort is humongous in size and is distributed over 17500 hectares of skiable land. There are more than 25 trails in Las Leñas, the difficulties of which range from beginner to pro. With top class accommodation and restaurants both at the base of the mountain and on the resort itself, this is one resort that provides the comfort of the highest order along with the thrill and excitement of Skiing. The resort even owns 30 snow machines that artificial snow in case the snowfall is not sufficient for skiing. Batea Mahuida is in front of a lake. Batea Mahuida is quite different from all the above resorts on the list. For one, the Batea Mahuida is an ancient extinct volcano with a volcanic lake in its center and two; it is entirely owned and operated by the indigenous Mapuche community. The Mapuche are a local community that settled in the snow-filled crater a long time ago. The resort is not as large as the others around the country, but it is far more unique. Apart from skiing, the resort also offers other services such as snowmobiling through the vast snow filled slopes, snowshoeing through the monkey-puzzle trees, etc.